If you've ever wanted to learn to draw, this is the class for you! Ever wondered how artists draw? Come find out and discover that you can draw, too! The ability to learn to draw is as universal as the ability to learn how to read, ride a bike, or speak a foreign language. Drawing requires that we disrupt our familiar patterns of observation. The Artist's Way of Seeing will teach you to shift your habitual ways of seeing, opening up new windows onto our world's endlessly fascinating subtlety. In-class exercises will introduce you to basic techniques and build confidence through practice. Learn how to compose with line, shape, and tone. Find out how to work with perspective, positive and negative shape, and texture as you explore the use of traditional drawing materials. A materials list will be provided. Teal Sallen grew up in Reading, Vermont. 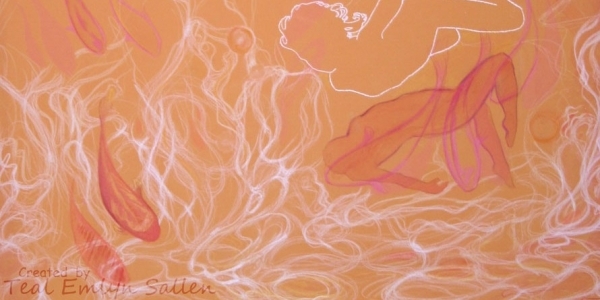 She is a 2D artist specializing in drawing, painting, printmaking, and mixed media. Teal earned her BFA in Printmaking at Massachusetts College of Art and Design in 2006. Teal’s style is representational and narrative, with a touch of magic and whimsy, and shows the artist’s enjoyment of light and color. Rather than generating a body of work in a single medium, Teal happily explores multiple ideas through print, paint, and pastel. Her curiosity about the human, the natural, and the fanciful can also be observed as a common thread in her diverse collection of work. To learn more about Teal, visit her website.